Can you mix bronze metal faucets with a stainless sink? I love some of the new rustic finishes (ie. California faucets weathered copper/bronze) but am planning to install a stainless sink. Would that be acceptable? Yes, you can mix a bronze finish faucet with a stainless steel sink. The use and presence of stainless steel in our homes has remained strong and has gained a much stronger presence over the past two decades to the point where we now consider it to be a neutral. 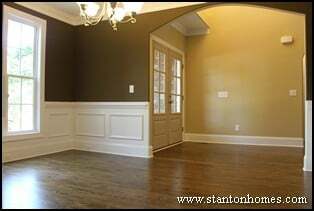 Its finish is considered to go with most anything the same a wood floors and white painted trim go with anything. All of those items are so common that we consider them to be universally acceptable to mix with anything else you desire to have in your home to personalize it as yours. What to think about when deciding to go with a bronze faucet for example, is the "story" in your room or in all common areas of your home that can be seen at the same time, such as, quite commonly, the foyer, dining room, great room, and kitchen. 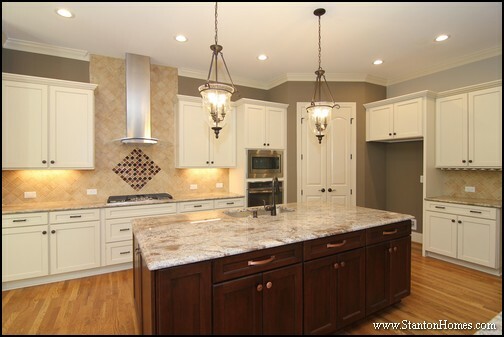 We create cohesion by looking to cabinet hardware, or lighting, or door hardware (knobs/levers and hinges). 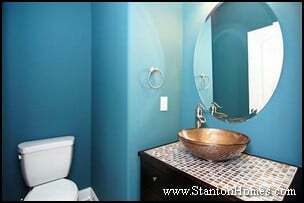 If you want to use a bronze faucet think about what else it could connect to so that you create a cohesive "story" in your space. Sometimes it's not even the other metal finishes that can make a bronze faucet "work" in your room. For example, the bronze faucet could even tie in to dark Espresso cabinets where everything else is brushed nickel. Bronze and Espresso faucets can appear very similar, especially from a distance. So, that's how it's done when you want to mix finishes; stand back and look at your entire space and connect things somehow to make your story work! Get more ideas in our Ideabook of kitchens with stainless steel sinks and bronze faucets. Have a kitchen or interior design trend question for your new home? Ask Andrea, and she'll let you know all the latest in custom home and design/build trends! 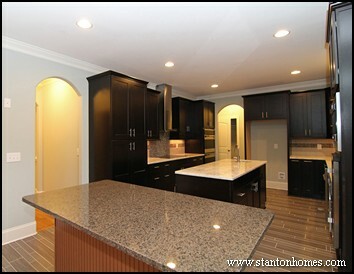 Andrea works closely with each Stanton Homes client to help design homes that fit every lifestyle and taste. 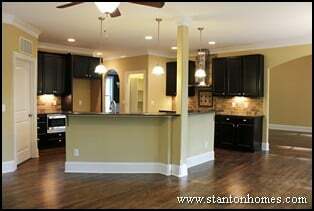 Kitchen counter tops, including islands, are approximately 36 inches tall. Kitchen bars are approximately 40 to 42 inches tall. 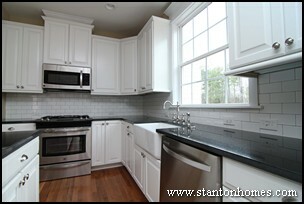 The height between counter tops and upper cabinets - generally the tile back splash area - is usually 18 inches. 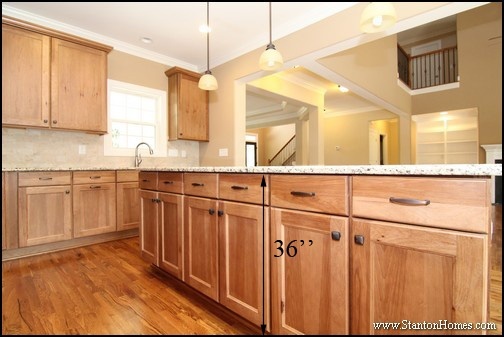 What's the distance between a counter top and upper cabinets? 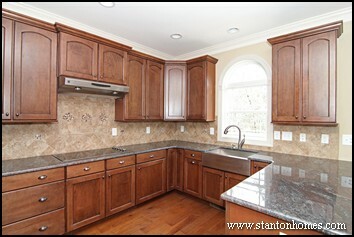 The upper cabinets are typically 18'' above the counter tops. An 18'' gap leave plenty of room for countertop appliances, without placing the cabinets above easy reach. 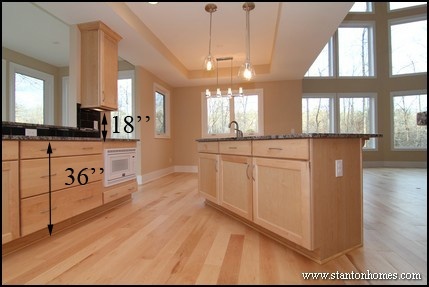 How tall are kitchen islands? About 36'' for a countertop height island, though many islands also include raised eating bars. 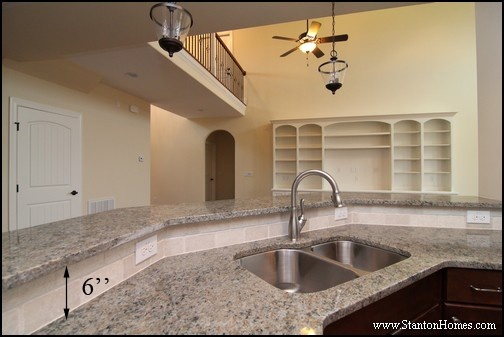 Your kitchen island will match the counter top height, at a standard 36 inches tall. First, there are typically no upper cabinets above an island or eating bar, so appliances and other items don't need the same clearance space. Second, your eating bar should be at an easy-to-use height, a total of about 42 inches from the ground. The standard height for most tables, whether in the breakfast room or formal dining, is about 30 inches tall. 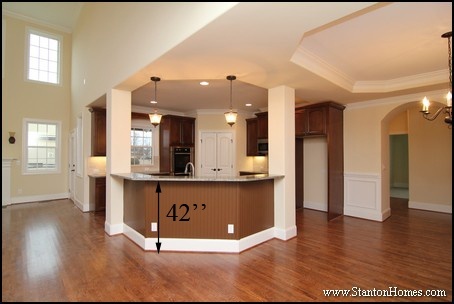 You can gauge the height of your table alongside popular chair rail and wainscoting heights. 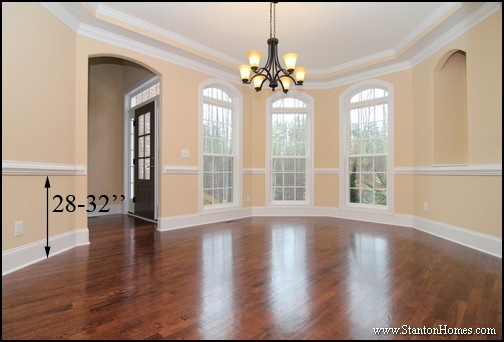 There is no standard wainscoting height - wainscoting and specialty trim depend on the ceiling height, room proportions, and stylistic appeal you're wanting to create. Typically, chair rail is installed between 28 and 32'' from the floor. 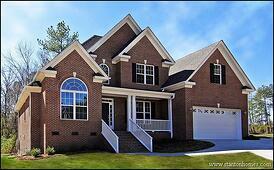 What does a "standard" custom home cost to build in the Research Triangle Park of North Carolina? 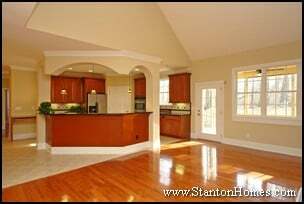 Tell us about the home site and floor plan you're interested in, and Stanton Homes will provide an initial cost estimate for your new home. Chef style kitchens often feature ample counter top (and island) space for prep work, multiple ovens for multi-course meals, large pantries and cabinets for storage, and extra wide ranges for dual-cook use. The range ventilation hood - often large and eye-catching - can take center stage in these chef style kitchens. 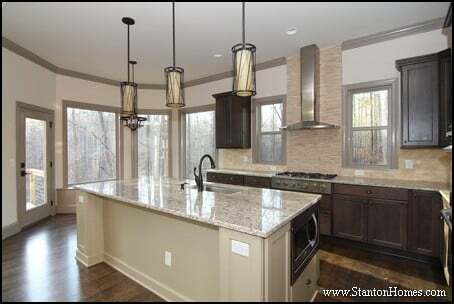 See photos of seven range hoods - from copper colored to glass accented - in these Raleigh area new homes built by Stanton Homes. 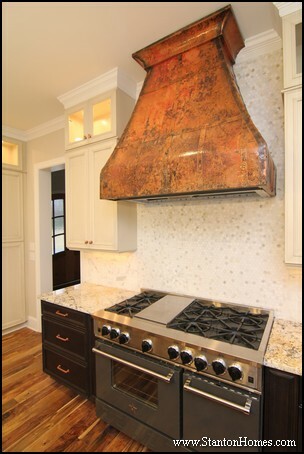 A hexagon mini mosaic tile backsplash extends from the gas range to the ceiling - serving as a subtle backdrop to an antiqued copper range hood. Glass-front cabinets extend to the ceiling - adding height throughout the kitchen. In this version of The Dinsmore, the stainless steel range hood, black island lights, and cedar accents merge mountain home charm with modern home character. A wine fridge and wine rack - more must-haves for chef style kitchens - are tucked into one side of the large, curved island. 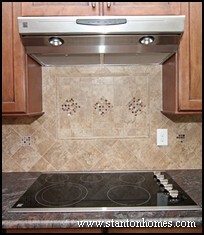 If you want to de-emphasize your range hood, consider an all-cabinet design, which conceals the hood vent. White cabinet fronts extend above the range, for a soft, classic kitchen design. Are you drawn to kitchen designs that incorporate a mixture of textures and colors? In this version of The Shelby, an additional cabinet rests above the stainless steel range hood, adding even more storage space. 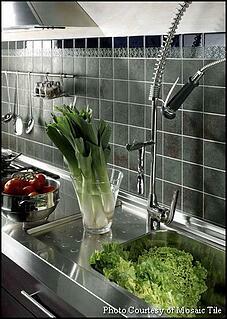 Mini tiles wrap around the kitchen walls. 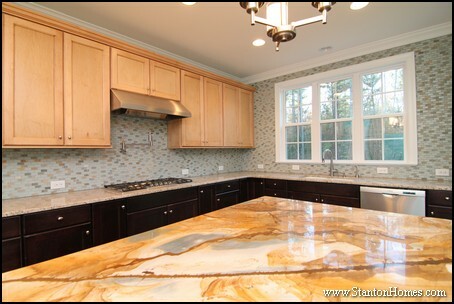 The granite island pulls together all colors and textures in this vibrant kitchen. This kitchen - a version of The Country Manor - showcases a similar under cabinet range hood combination, with contrasting tile, cabinet, and appliance selections. Carved wood island legs add another texture - and color - to this timeless kitchen design. 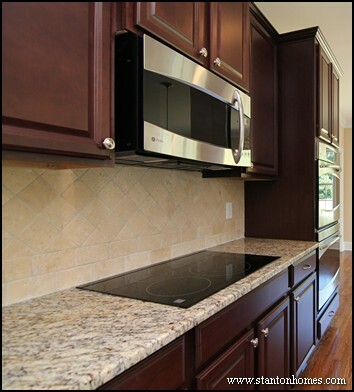 Another way to make your kitchen range hood stand out is to add a touch of curved glass. Glass accents are found more often in modern style kitchens - which emphasize whites, blacks, greys, metals, and contrasting lines. 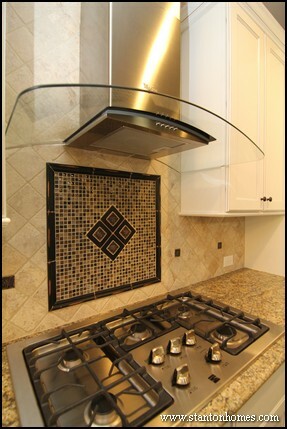 Here is another glass range hood idea - with a custom tile accent below. 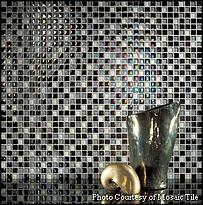 The tile back splash can transform the overall feel of your kitchen range. In this version of The Shoal Creek, a rubbed bronze tile design emphasizes a more rustic kitchen style. Range hoods are essential kitchen appliances that serve a very practical purpose, designed to dissipate smoke and cooking fragrances. 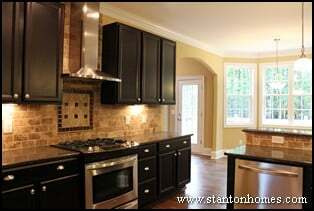 When you build a custom home with Stanton Homes, our design team will help you choose the right range hood for your kitchen design and lifestyle - with recommendations on the size, material, style, and location. 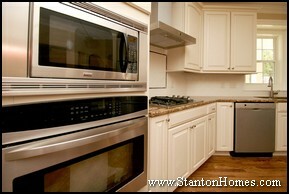 Kitchen Appliance Tips: Wall Oven or Range? 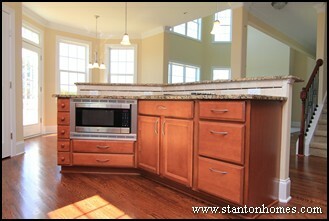 Contact Stanton Homes to learn more about building a custom home in North Carolina. Keep the most prominent features in mind when you design your new kitchen. Start with a single aspect and create around it - like an artist. Think about textures. 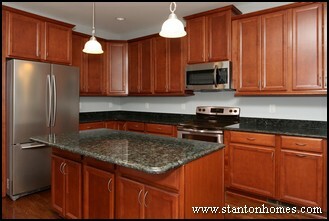 Granite countertops remain popular and you can wrap your room around that as a central point. 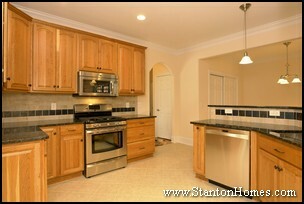 Look at kitchens in new home videos, and check out places like Pinterest for an idea that sparks your overall theme. A neutral kitchen such as this example allows a lot of flexibility in the design - The stainless steel gas stove blends seamlessly with the flat black sink and faucet. Click here for a photo gallery of this home, a version of the Brogan. 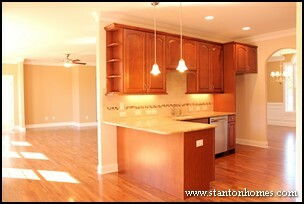 The kitchen flooring style has a bit more flexibility in this color pallet. With white cabinets, a darker floor finish will look more appealing; with espresso cabinets, the flooring should trend on the lighter side. 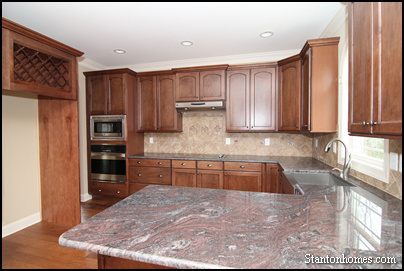 If two cabinet colors are incorporated, a hardwood with a light or grey stain can look great. Click here for a photo gallery of this home, a version of the Worthington. This kitchen palette makes it easy to choose either stainless steel or black appliances and fixtures. If the granite counters incoproate flecks of black, consider black appliances. To prevent warm browns from overwhelming the kitchen, make sure your design includes plenty of natural light, and keep the wall color a light cream or beige. Click here for a photo gallery of this home, a version of the Bostwick. Are Stainless Steel Appliances Going Out of Style? Whether you want an island, a peninsula, or just a lot of countertops, top it off with a tile backsplash pattern packed with personality when you choose your favorite kitchen design features. Check out these kitchen backsplash pictures to see what we've been told are some of the best backsplashes of 2014. 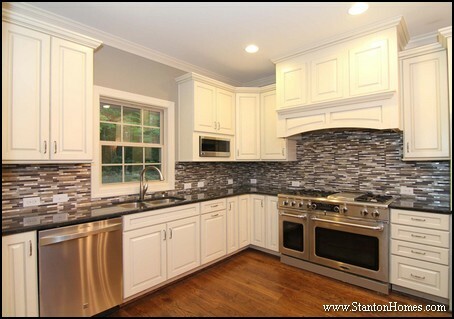 This tile backsplash was built into a version of the Bostwick* in Wake County. Tile combinations are open to your own interpretation in a custom kitchen, like the way these mini-mosaic designs integrate white, lilac, green, turquoise and burgundy squares. These custom touches can make your kitchen completely unique - and your decorating and coordinating potential is limited only by your imagination. The result of fresh choices like these can bring unexpected elegance, created by your own interior design choices. Our second kitchen backsplash example, designed especially for a version of the Chalet Vert, is mesmerizing - with a glass and stainless steel range vent reflecting back the mini-mosaic design. 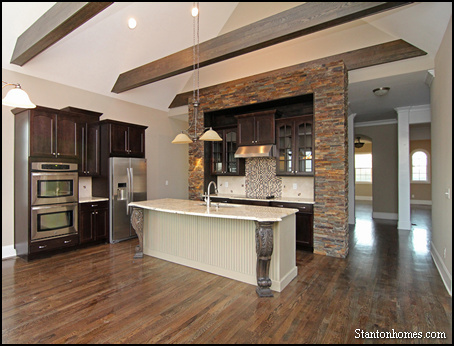 In 2014, custom home kitchens will entertain some more eclectic style choices - like this kitchen custom designed for a version of the Country Manor. This kitchen includes a stone surround, wooden beam ceiling, contemporary tile backsplash, custom carved wooden island posts, glass front cabinets, and stainless steel appliances. Not the creative type? 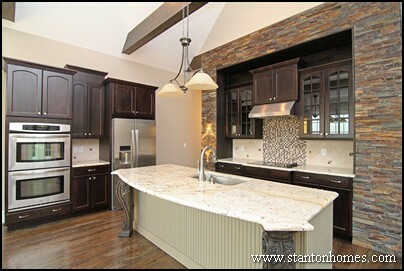 Custom builders like Stanton Homes provide interior designers who listen to your ideas and show you even more ways to pull together the environment you want to create, with texture, tone and color that will make your kitchen warm and welcoming - with personality that's uniquely yours. These kitchen backsplash pictures, taken from a version of the Blackhawk, reveal how colors can be subtly blended to create high-end appeal. 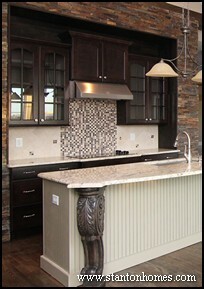 A unique rope design serves as the listello accent in this custom kitchen. Looking for a classic design that will never go out of style? This kitchen backsplash example was designed for a version of the Mastrosimone, to reflect a timeless combination of medium brown cabinets, light stone pattern granite countertops, and black and stainless steel appliances. The raised height island bar features a subway tile design, while larger surface areas show a combination of subway tiles and diamond patterns. See more of these great kitchen designs in the photo tours of the homes pictured in this article by clicking on the images below. 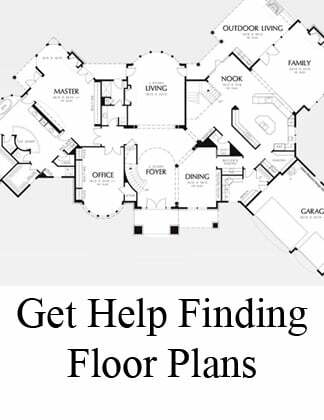 Get more ideas for your kitchen, master suite bathroom, family gathering rooms, outdoor living spaces and more. 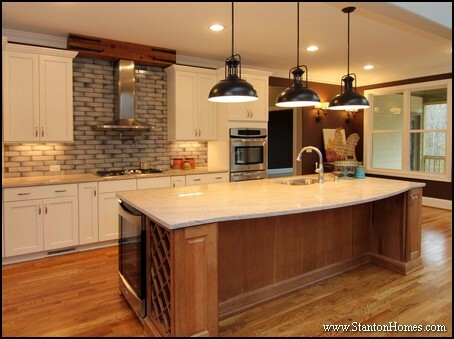 Stanton Homes will listen to your ideas, sketch up your concepts, and create the environment you're looking for, as we design and build your custom kitchen together. Kitchen Trends | Are Bronze Appliances On Their Way In? Which Style Will Replace Stainless Steel Kitchen Appliances? Is Oil Rubbed Bronze the Next Big Trend? 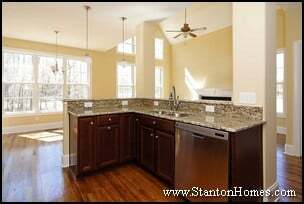 What's the next Raleigh custom home trend after stainless steel appliances? I see some oil rubbed bronze in Jenn Air, but it looks almost brown. My friend's mother has goldish bronze appliances from the 60's and are nice looking. Will these bronze colored appliances become popular in new home kitchens? Thank you for your question regarding color trends for major appliances in the home. You mentioned the bronze appliances by Jenn Air - those were actually launched back in 2006. Jenn Air was obviously hopeful that these appliances would be a big hit running alongside the popularity of the Oil Rubbed Bronze finish for plumbing fixtures, lighting fixtures, and bath, door, and cabinet hardware. However, your remark that the bronze appliances look almost brown to you, coupled with the fact that they remind you somewhat of some older appliances from the past - specifically it sounds like you may be referring to appliances from the era of the Harvest Gold appliances that were first actually introduced in the late 1960's (along with Avocado Green) - precisely pinpoints the reason the bronze appliance launch has not really caught on. Although the idea was new, the Oil Rubbed Bronze finish was designed and introduced into the marketplace to be a compliment to the many decorating looks that became popular through the 1990's and into the first decade of the 21st century. These styles include Old World looks, French Country, English Country, and so on, which were designed to look old or antique in nature. The most popular styles are often modern versions of styles from the past. The Oil Rubbed Bronze concept is sometimes appealing when it comes to free-standing ranges and decorative hoods, but generally, we want our appliances to look new and up to date as this also gives the perception that the kitchen has been updated and that every appliance will perform with the speed, accuracy, and convenience that we as consumers demand more and more of with every passing decade. So, will we see more Bronze appliances and will we see a return of Harvest Gold? I have not seen that on the horizon from the Appliance Council Of America, nor have I seen that rumor from the Color Association of America. Although we may find comfort and sometimes glamor in Bronze and gold finishes throughout the home, the theme of modern convenience coupled with the Professional look and feel of stainless steel will continue to be the leading themes in residential appliance finishes. 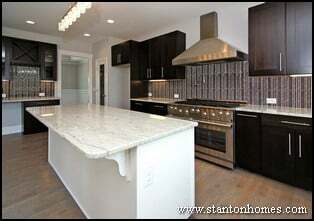 At Stanton Homes, 24 of 25 new homes slated to complete this year have already selected a stainless steel appliance finish. Thank you for your thought-provoking question - please don't hesitate to call on us again for decorating advice or opinions." Have a kitchen or interior design trend question? Ask Andrea, and she'll let you know all the latest in custom home and design/build trends! Want to Know About Other Kitchen Design Trends? 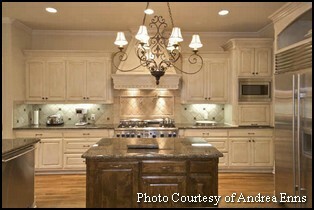 Click Here for More Answers to "Ask Andrea"
What New Home Interior Design Colors Will We See Most in 2012? If the Mayans thought the world was going to end in 2012, then perhaps that was simply their hope after having encountered one too many decorating dilemmas. Sometimes selecting color can be one of the most daunting of those dilemmas—so, the blissful are perhaps the color-blind for it all looks good to them? Well in some cases yes—actually things often just look the OPPOSITE color which is very handy sometimes in a dilemma: Knowing what colors my father THOUGHT he liked, whenever he asked my mother if something for the house was “green” (his favorite color) she would deftly reply that it most certainly was—but the item in question was RED—coincidentally her favorite color! He never knew the difference. Red and green are opposites on the color wheel and so they are direct compliments to one another. 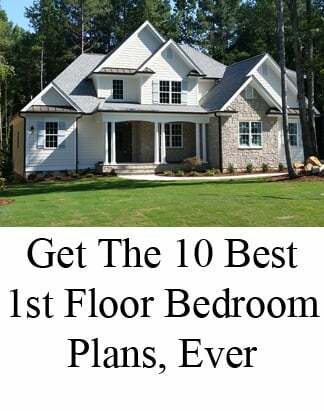 Take a traditional brick home and watch it literally come to life as the green sod is laid—it’s not just because there is finally grass—it’s because the colors are true compliments to one another. With all of the science behind color, why do we even care about color trends? Some people will tell you that they don’t care about trends, but if they watch TV, read magazines, and are generally aware of the media, the guru’s (known as color forecasters) at The Color Association of America will know what you’re going to like anyway - they helped put the color in front of you as companies launching new products will consult them as to which color will best sell the item – so do you like the color because they put it in front of you or did they put it in front of you because they knew you would like the color?? Who knows—they also call it “Color Intelligence” amidst the covert operations over there at the association’s head quarters and I can see why! 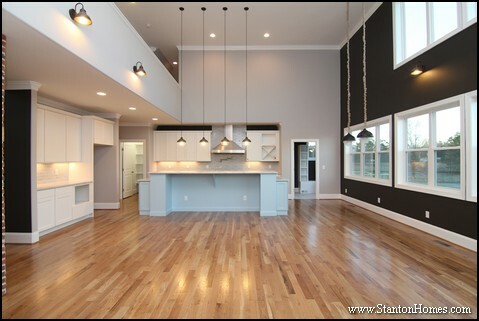 What are the most popular 2012 new home design colors? Blues have been subtly hinting about their comeback for a couple of years now, showing up at first in more formal rooms and appropriately through several of the hard to define shades of gray we have been enjoying. (Of course, isn’t that just like gray to be seen more than one way). 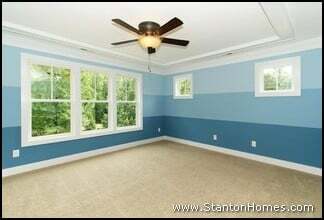 However, in home furnishings and paint colors offered for 2012, blues are definitely back as true blues and will see a strong following since many people naturally favor blue anyway. Pale blue walls can work in both traditio nal and light hearted modern settings. At Stanton Homes, we have a home due to finish in the early part of next year; a pale sky blue has already been selected for several rooms and ceilings. 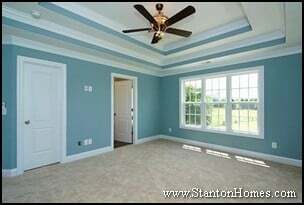 A blue ceiling has been a decorator favorite for a long time. It is as uplifting as looking up at the sky. Choose a very subtle shade or one that is slightly blue-green. You can use it almost anywhere and it almost has more panache if there is nothing else in the room that is blue. 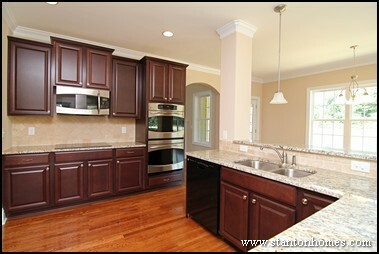 It looks outstanding with the very dark brown tones we have been favoring in cabinets and hardwood floors. 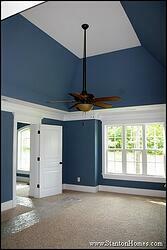 It is also the traditional choice for the bead board of a true southern porch ceiling. On the other end of the spectrum we have deep dark navies –we love how great they show off the crown molding and baseboard and even though they are just as dark as the dark brown floors, the two elements together are nothing short of stunning. Just try to miss the strong influx of blue in any current decorating magazine—it’s impossible to miss and too irresistible to pass up. If by some slim chance you are still not convinced of this trend, just consult any older teenager or college student. They are the trend setters who give the nod to anything new that they deem worthy of their affection. I have one of these said creatures in my household and last July she announced, quite out of nowhere, that we needed to paint her room dark navy. Says the idea just popped into her head. Greens seem to be remaining strong as the second most popular accent color. They too have been influenced by last year’s grays and browns. Take for example the popularity of bronze—especially for last summer. Shades of bronze can be found as the deepest tones of green-browns on the color wheel. There are also light greens influenced by gray as are often found in colors that remind us of beech pebbles or majestic mountains, or even the ocean. Again, just like blue, greens tend to work wonderfully with the dark brown floor stains and dark Espresso Brown cabinets we are still so fond of. With that being said, are you ready for white cabinets again? Still? So soon? Did they ever really go away? In my opinion white cabinets never really go out of style. They are as classic as white tile and since new generation after new generation finds ways to present them as both “new’ and as classic, white cabinets will always stay around. They can work with any kind of interior depending on the door style. Somehow “white’ in general always comes back as new. What color are the newest i-phones? I rest my case. Coincidentally Stanton Homes has just ordered two new white kitchens amongst many many dark brown maple Espresso kitchens. In fact, the same trendy folks who chose the blue accents are going with a combination of painted white maple cabinets, Absolute black granite, white subway tiles, tall white bead board paneling, and rich Chestnut brown hardwood floors. This home is brimming with colors and style that are American classics. It is currently called the Carwile, but we may have to re-name it the “All American”. And, coincidentally or not, since the folks in Intelligence at the Color Association of America will say they knew it all along, the other white kitchen is scheduled to have green walls! How perfect is that? So, fear not the color trends but embrace them and feel confident that for whatever reason, you will like them! 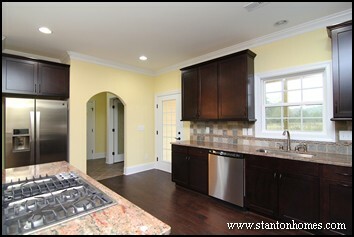 At Stanton Homes we’re glad the Mayans were wrong and we look forward to all of the unique and beautiful homes we will have the opportunity to build for our customers in 2012. "I have off-white maple cabinets with hazlenut glaze and dark chocolate cherry cabinets with a White Spring granite countertop. I like transitional look. What backsplash will go with it? 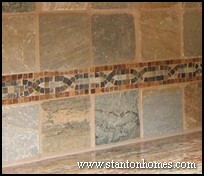 Glass or stone/travertine tiles or a mosaic blend? 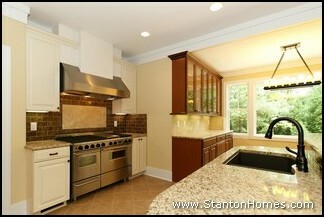 Second, should we get the 4" granite backsplash and then do tile over that or just do tile everywhere? My husband only likes the tile in the cooktop area going over the custom hood to the ceiling and plain 4" backsplash everywhere. 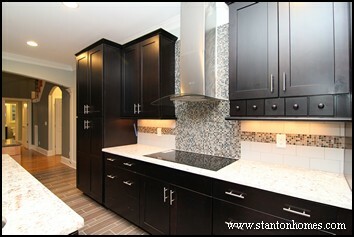 What is the design recommendation on doing different style of backsplash in different areas of the kitchen?" First of all, let me say that I love seeing a mix of cabinet finishes in a kitchen--what a great look with the White spring granite. You have asked several good questions regarding tile choices for a back splash however since you said that you prefer a transitional look, I am going to make some specific recommendations. Firstly, since there is not a lot of area to tile in a backsplash in the first place, you are kind of working against your look if you have both a 4" splash and then tiles above it to the cabinets. I would go without the granite splash and just install tile from counter to cabinet to make the most of your design and the impact it will have on the kitchen. Secondly, since I work with married couples all the time who have different preferences at times, I always try to recommend a compromise--in most cases this means a blend of both preferences. I think the best way to enjoy your home is to make decisions together and that the decisions, where possible, should reflect both tastes. How better to create harmony? In this case, I think that either a glass mosaic or one of the transitional mixed mosaics would be a good choice for the range area. There are some very beautiful mosaic blends available that incorporate natural stone, glass, and metal all in one mosaic. They are truly works of art all by themselves. 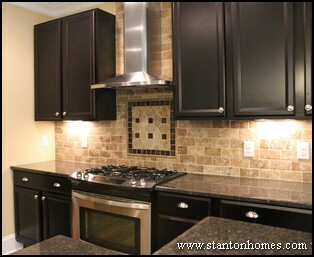 Then, for the rest of the back splash area I would recommend using a large rectangular tile in a dark, rich, earthy hue. I think this would off-set the granite very well. There are some rectangular shaped tiles now available in more irregular sizes such as 4 x 7, 4 x 9, 5 x 9, etc. The traditional 3 x 6 brick design (the subway tile) has stood the test of time for well over 100 years, and now tile artisans are spicing it up and making it transitional by breaking into larger sizes of all sorts and by using very rich colors. By mixing both a large brick tile for the main back splash areas with a mixed mosaic for the cooking and hood area, I think you will have a transitional look and will have created something that caters to the preferences of both you and your husband. Finally, don't forget under cabinet lighting to make the most of everything you have done. 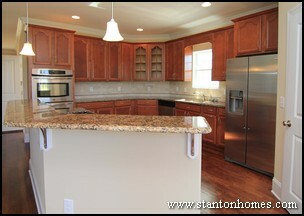 Stanton Homes continues to offer the information you're looking for. 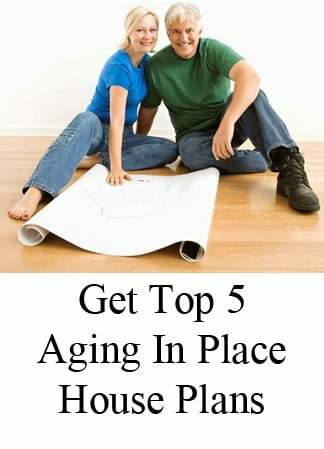 Check back for more interior design trend tips! 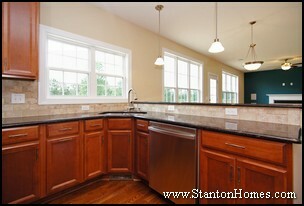 Send us YOUR design questions to "Ask Andrea", and look to Stanton Homes for the answers you need. Andrea Enns is an on staff design expert at Stanton Homes, offering FREE professional design selection services to custom home clients as part of Stanton Homes' exclusive custom home packages. 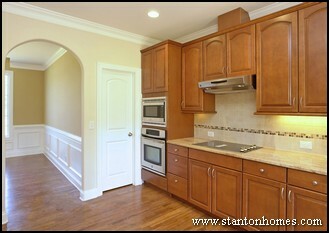 Kitchen Design Planning - Where Should the Microwave Go? Lifestyle concerns, such as the number of cooks in the kitchen and ease of use (including universal design aspects), can help determine where the microwave should go when you design the kitchen for your next new home. 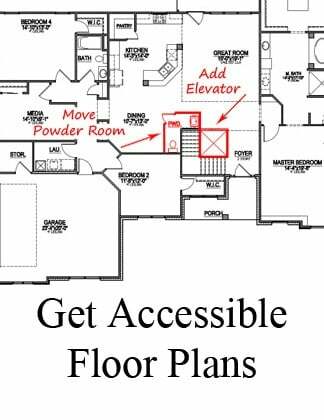 Practical concerns, such as microwave width/height/depth and the placement of other appliances (especially the refrigerator), can also affect your placement decision. One of the most popular places to keep a microwave is above the range. In this custom home, the microwave is central to the rest of the kitchen - with easy access to countertops (including the island), refrigerator, and sink. This microwave is probably at the maximum convenient height. This custom kitchen design takes advantage of the most common day-to-day traffic pattern: from refrigerator to microwave. The large, professional grade range/oven takes up the majority of space and notoriety in the kitchen, while the microwave maintains ease-of-use aspects. 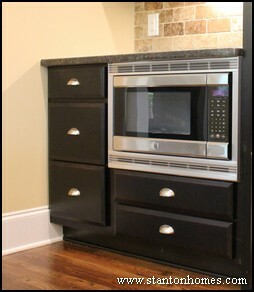 This kitchen design places the microwave at eye level, a height more managable for many people. The refrigerator is placed directly opposite the microwave, and there is plenty of "landing space" to the right of the microwave, to set hot plates. Microwaves are placed under the counter when they are used less often than other kitchen appliances, or when height is a concern (such as in accessible kitchens). This custom designed kitchen places the microwave between the walk-in-pantry and the refrigerator. 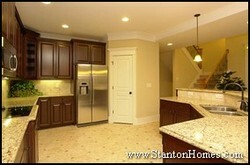 Finally, the under-the-island microwave design is becoming more popular among new homebuyers, as well. In this kitchen, the cooks can share island counter space, while looking out to the breakfast room and two-story great room. 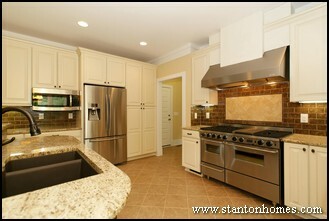 2012 Kitchen Design Trends - Is Stainless Steel on its Way Out? 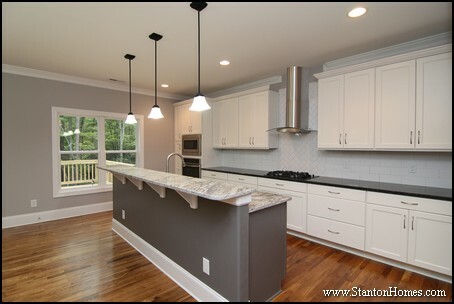 Get ideas from these kitchen floor plan transformations, designed by Stanton Homes to fit the lifestyles of our homebuyers.